In 1849, a year after gold was discovered at Sutter’s Mill; Richard McDonald opened a drug store at 143 J Street in Sacramento California. McDonald’s first drug store was operated from a wood and tent structure and sometime in 1852 he took as a partner a Mr. Levy. Sometime in 1853 the partners started a traveling drug store to supply remote mining camps with medicinal supplies. McDonald and Levy’s idea of taking a wagon load of medicine and drugs to the miners was not revolutionary but their timing was perfect, few if any early mining camps at that time had a drug store or a place to buy medicine. It is believed that Levy ran the medicine show (or traveling drug store) while Mc Donald was in charge of the store on J Street in Sacramento. Levy took his wagon from the placer diggings in the Mother Lode foothills all the way up into the northern mines area of the Sierra Nevada Mountains peddling the wagons nostrums’. By early 1860 the R.H. McDonald Co. was primarily a wholesale drug business with a branch office in San Francisco and an agent for William T. Cutter Whisky. One of McDonald’s best selling products was J. Walker’s Vinegar Bitters and was responsible for the great success of his company. McDonald continued in the wholesale drug business until his death in Montreal Canada in 1903. 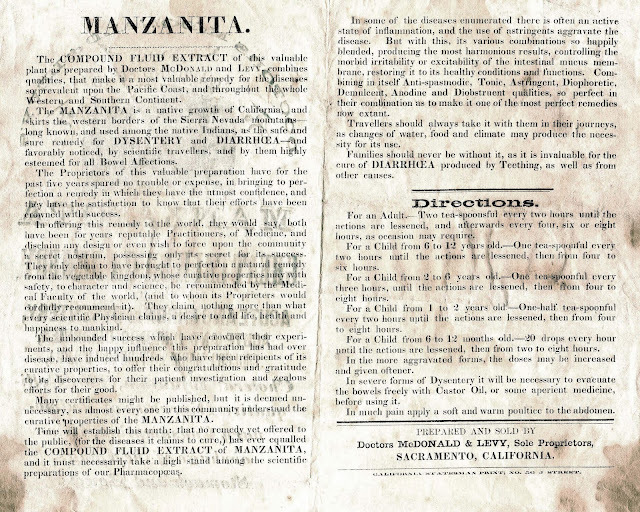 The Compound Fluid Extract of Manzanita bottle produced by McDonald and Levy is believed to have contained a remedy for the rash from poison oak or ivy. I have no concrete proof that the Manzanita product was a cure for poison oak. Back in 1993 two undamaged examples of the Manzanita bottle were recovered from the early gold rush settlement of American Hill. 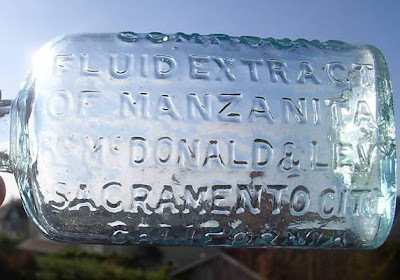 Another example of the Extract of Manzanita was discovered in the Forest City area in the late 1990’s and later sold at a Glassworks Auction. Both American Hill and Forest City are located near the Henness Pass Road, an early wagon road used to reach the gold rush camps in western and southern Sierra County. The discovery of these bottles near a major gold rush road and the abundance of poison oak in that vicinity lead me to speculate that old Doc Levy’s traveling medicine show quite possibly visited the Southern Sierra County area during gold rush times. No poison oak cure but it did a lot of other good things - especially in the realm of diarrhea and dysentery. Highly recommended for travelers, everyone knows how troublesome those afflictions can be - especially when you are on the road, with no outhouse nearby. Great piece of information on the Manzanita product...for the last 40+ years I thought this was a poison oak remedy. 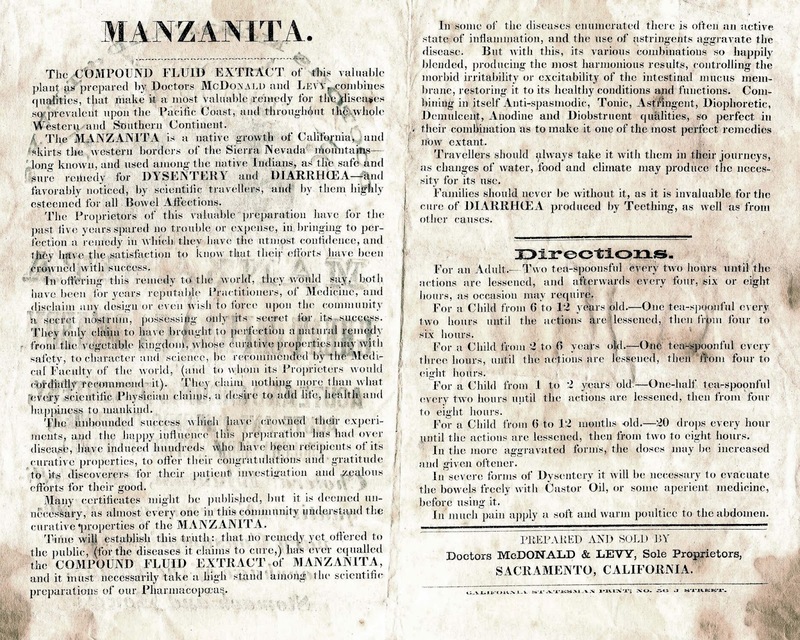 Although the Manzanita compound appears not to be a poison oak remedy I still would like to believe that Doc Levy traveled the roads in southern Sierra County, during the gold rush, that I travel today. Rick, I really got a good laugh out of the picture and caption" while we are all waiting" Great choice.